With the warmer weather we have been having, it is only natural to want to spend more time outside. Your outdoor ventures will be so much more enjoyable with a beautiful backdrop of a large, lush hydrangea bush! 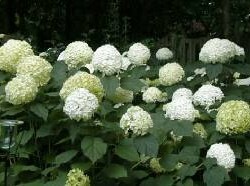 At Hutcheson Horticultural, we sell the Annabelle Hydrangea, one of the best known varieties of this beautiful plant! The annabelle hydrangea can be used as a hedge, because it can be cut back without affecting its lush appearance. Versatile and adaptable, this plant is easy to plant and hard to kill. They prefer a moderate climate with morning sun and afternoon shade, or a mixture of sun and shade throughout the day, especially here in Georgia. One common problem with any hydrangea is the weight of their blooms often become so heavy that they break off or damage the plant’s integrity. Here are some helpful tips for preventing this. Placing two or three hydrangeas close together will allow them to mature and support each other. NOTE: Three to four feet is a good distance for them to be separated. If your hydrangeas flatten out after rain, it may help them to not be pruned to the ground each year, but instead to around 18” to 24:. This will allow the stems to thicken, and become sturdier over time. If the Annabelle Hydrangea sounds like your perfect plant, let us know! Contact Hutcheson Horticultural for all your Horticultural needs! Enter your email to receive periodic updates from Hutcheson Horticultural! © Copyright Hutcheson Horticultural Company. All Rights Reserved.